Clash of clan is one of the best and most played strategies games worldwide. This game is developed by Supercell keeping the mobile and tablets users in mind. If you have played this game then definitely you know how much time does it takes to build your base and collect resources. But wonder if you get all the unlimited resources for free. Clash of clan is a server-based game and all your game progress is cloudly stored on the clash of clan server, So it is quite difficult to hack this game using lucky patcher. To get the unlimited resources(Gems, elixir, Gold) you have to install the private servers others then Clash of clan servers. These other servers are called COC private server. By using these COC private servers you can access the unlimited Gems and other resources which will help you to build your base quickly. Below we have Listed the Best Clash of clan Private servers which you can try. So let’s get started. 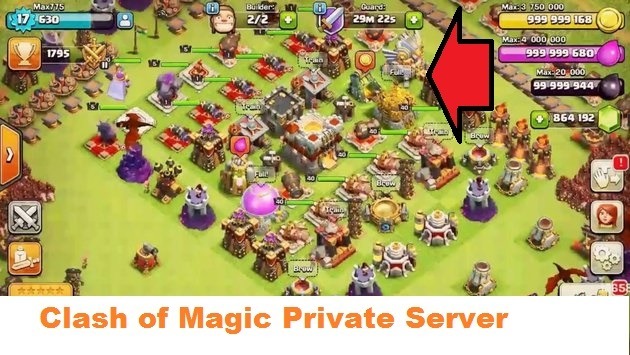 This is the best and most popular COC private Clash of magic has its own 4 separate servers namely Server 1, Server 2, Server 3 and Server 4(S1, S2, S3, S4). Each server has its own set of features. The Clash of magic can be installed with the original Clash of clan game. It will help you in setting the best strategies while playing the original game. This mod also features the Custom modified characters and custom buildings. After installing this COC Private server one can easily build his Base to the maximum level within minutes. Supports both ios and Android OS. The Clash of Magic is available on four different servers namely S1, S2, S3, and S4. The best part about this server is that it gets updated frequently as the original COC servers get updated. Server 1(The Black Magic) is highest moded and supports all modification like Unlimited Resources, Custom Heroes and Buildings.recommended to the players who need extreme modification in their games. Server 2(The Hall of Magic.) is slightly less modified then the server 1 but still features unlimited resources. If somehow server 1 is not working you can easily replace that with server 2. Server 3(The Power of Magic.) is recommended to the players who need slight modification as it comes with the free 10000 Gold, elixir and dark elixir. Server 4(The Power of Magic 2) In this server the players will get the original(Stock) Experience that of Original Clash of Clan. The thing I liked most about this COC private server is it gives the modified characters which other servers rarely provide. Clash of Light is very much Similar to the Clash of Magic. It lacks in the regular updated and development so that’s why it is placed on no.2.Clash of Magic has all the features of ordinary COC game as well as features of COC private servers. It also has for different servers namely S1, S2, S3, S4 but there is not much difference in these servers. The only difference which I noticed is its speed and optimizations. The S4 is the most optimized and speedy among all others. The features of Clash of Lights includes unlimited resources. I am listing down the main Features of Clash of Lights but they keep adding more and more features with the new updates. Before installing this COC private server you will need to un-install the Original game. After installation of this private server you may face some loading issues but be patient and wait for the game to initialize its all processes properly. Don’t restrict you background data as this server processes its data in the background. The other thing which I noticed is that this server needs the Strong internet connection to work properly. A strong wifi connection is recommended when initializing the game for the first time. This is the oldest COC private server. The FHX server firstly introduced the concept of Private servers for the server based game. The FHX server has the extreme variety of the modification. In fact, the FHX server has now become an open source server now. A lot of people customize this server according to their needs. Its a headache to find the right FHX server for clash of clan but don’t worry I have given the latest download link below. The main features of FHX servers are listed below. The FHX server also has three main sub-servers which I have listed Below. FHX Server A: This server doesn’t have any modification, the Only difference between the original game and this COC private server is the availability of unlimited Resources. You can build you empire using these Unlimited resources but you will not get any custom character or modified building on this server. Instead, you will get the stock character and building which you can upgrade using the unlimited resources like Gems gold and elixir etc. This server is perfect for developing a good defense and attack strategies and to test your current base in original Clash of clan game. Download COC FHX server A – here. FHX Server B: This server provides preloaded modified character and custom building which you can enjoy by attacking other’s bases. Download COC FHX server B – here. FHX Server X: This is the most ultimately and best Clash of Clan Private Server base on FHX. It gives you the privilege to create the customized characters and modified characters as well as the unlimited resources. Download COC FHX server X – here.